While there is a sky high competition between tablet products, many of us may be confused for buying one. Certainly with latest specs and considering crucial cost factor, below comparison sheet will help you to decide your next brand. 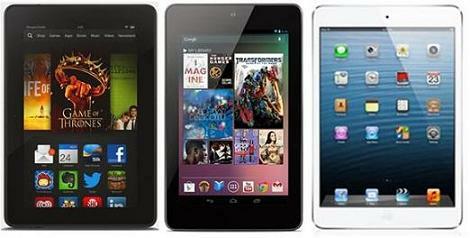 Currently iPad Mini, Kindle Fire and Nexus 7 are top three tablets available in the market. Cost wise Kindle Fire and Nexus 7 are the best available options. Let's have a look at the comparison. Considering latest displays of all three tablet devices there is undoubtedly no difference between their qualities. However, initial iPad Minis were having low-resolution displays. Nexus 7 and Kindle Fire HDX have 323ppi resolution whereas iPad Mini has a 324ppi resolution. Nexus 7 have clearly stunning display qualities. iPad Mini new uses latest Apple's own A7 64-bit chip whereas Kindle Fire HDX uses top of the line 32 bit Qualcomm Snapdragon processor and Nexus 7 uses an older version of it. Apple's iPad Mini is as twice costly as Nexus 7 or Kindle Fire HDX. It has an approx price tag of $400. Nexus 7 costs approx. $220 and Kindle Fire HDX has around $229.